Combined team hailed by Considerate Constructors Scheme at presentation ceremony in Edinburgh. 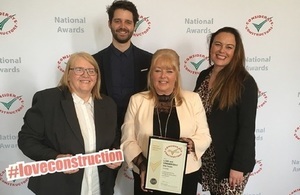 LLW Repository Ltd (LLWR) and Framework partner GRAHAM Construction have struck Gold at the Considerate Constructors Scheme (CCS) Awards for the second consecutive year. The Engineering, Design & Construction Framework (EDCF) team based at the UK’s low level radioactive waste Repository in Cumbria was hailed for its “outstanding commitment to improving the image of construction,” and a joint team from the two organisations was on hand in Edinburgh to collect the National Site Award. The CCS noted that 90% of subcontractors were local, highlighted the strong commitment to Equality, Diversity & Inclusivity (ED&I), and to keeping the workforce informed on a wide array of project information via digital screens, including safety, environmental matters and job opportunities. “In every aspect, this was an exceptional site,” CCS concluded.